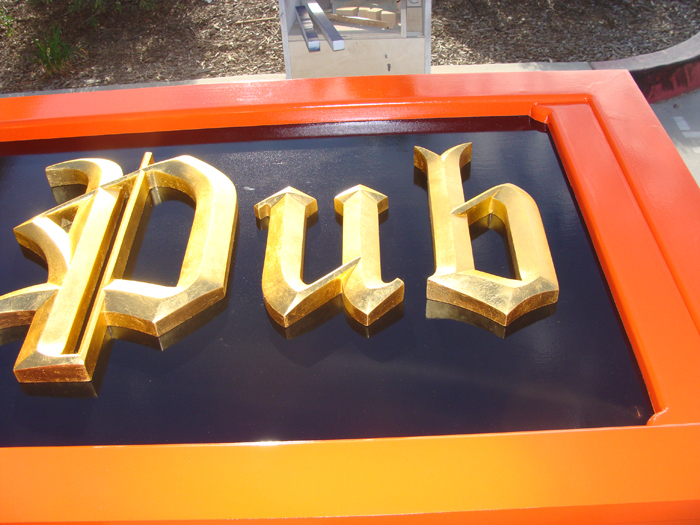 Above is a photo of a High-Density-Urethane (HDU) sign for a pub with separately carved 3D letters which are gilded with 24K gold leaf. This sign is 72 inches wide,, but similar signs can be purchased in any size from 12 inches to 120 inches in length. We can make a 2.5D (flat relief) or 3D carved and sculptured bas-relief (1/2 to 1 1/2 inch elevation relief ) metal-coated High-Density-Urethane sign wall plaque of any design in any size from 12 inches to 8 feet, for either indoor or outdoor use. Typical sizes are 18 , 24, and 36 inches in width. We gild all or part of our signs with 24 carat gold, sterling silver, and copper leaf. To see other pub and tavern signs, go to Gallery 27. To see other photo galleries. please click on one of the numbered gray boxes in the lower left margin of this page . To see prices or get Estimate and Order forms , click on gray boxes in upper left margin. Click on dark gray tabs on the header to see Home and other informational pages.